The Zonta Club of Auckland is fortunate to have three charter members still with the club, and Anne Gambrill is one of them. 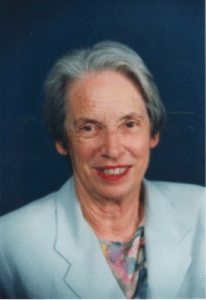 Chartered as the first New Zealand club in 1965, Anne was the second Auckland president and on the creation of Australasian District XVI formed in 1974, served at its secretary/treasurer. Among Anne’s many memories of fund raising and service projects undertaken in the last 50 years of the club’s history, two events stand out. In 1993 with Carole Shepheard, Anne initiated and found funding for the Zonta New Zealand Women’s Print exhibition organised by the Auckland Club that toured New Zealand galleries, and some small towns, to celebrate the centenary of women’s suffrage in New Zealand. This was a major undertaking, with serious logistical obstacles and good negotiation and sales skills required. The other event was representing Zonta on the original Laura Ferguson Trust board that purchased land and then built the first set of residential rehabilitation units in Auckland. The Auckland club paid for one of those units together with the subsequent purchase of a purpose built van for transporting wheel chair bound persons. Anne has had a long and distinguished career in the law, being admitted as a Solicitor in 1958 then as a Barrister in 1960. In 1987 she was appointed as a master of the High Court of New Zealand, one of the first two Masters appointed and the first woman to sit on the High Court Bench. She held this position for 15 years before retiring in 2002. She was the founding chair of the loosely-formed women’s group of the Auckland District Law Society Women members, from which grew the Auckland Women Lawyers Association. Anne was honoured in 2003 with the award of a Companion of the New Zealand Order of Merit. Now retired, Anne travels extensively overseas to visit three children and their families, and relaxes at their beach house at Omapere, Northland. She was the founding chair (2003 – 2007) of the Auckland Decorative and Fine Arts Society and currently serves as a member of the International Education Appeal Authority dealing with complaints by international students. She is still firmly committed to Zonta’s ideals and is an active member of the club. She has spent many hours recently finding, collating and organising the safe storage of their historical records.